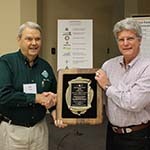 Distinguished Leadership Award | N.C. Tree Farm Program, Inc. The M. Robert Cooper Distinguished Leadership Award is presented periodically to an individual who has demonstrated extraordinary qualities of leadership and service. 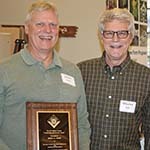 It is named in honor of Dr. Cooper, who served as the first Tree Farmer chair of the state program and was instrumental in the rebuilding of the program in the early 2000s.